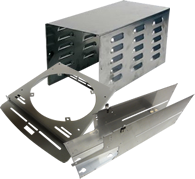 At Tempco Manufacturing, we utilize advanced production equipment to deliver high quality, high precision metal stampings and metal fabrications. We invest over $1 million annually to ensure that we have the latest stamping equipment, fabrication equipment, and secondary operation equipment available. We hire and train smart, motivated people to safely operate our stamping and fabrication equipment and to make sure our clients’ needs are being met on the shop floor. Request a quote or contact Tempco to put our advanced fabrication technology and stamping equipment to work on your project. Tempco’s precision tool and die making equipment includes water jet cutting, vertical machining, and drill presses. Our equipment provides the finest in manufacturing quality production. Precision metal stamping is a specialty at Tempco. Our state-of-the-art stamping equipment produces precision parts quickly and easily, without sacrificing quality. We have a variety of stamping presses with capacities ranging from 10 tons to 440 tons. We have automated fabrication equipment and a selection of welding and spot welding equipment to produce your precision metal parts. Our metal fabrication equipment consists of many different press brakes to meet all your metal forming needs. Our secondary operation equipment includes machines for deburring, cleaning, and part straightening. Secondary operations are part of Tempco’s quality manufacturing process and further enhance our precision metal stampings. Interested in learning more about the stamping equipment and fabrication equipment we use in our facility? Contact Tempco or request a quote to find out what we can do for you.